What a fun giveaway I have in store for you today! Our sponsor is Mark's Finest Papers, and we have a plethora of items for one lucky winner! The stamps used on the card above are just one of the prizes in this package. The Masked Spellbinders Card (April 2010 Technique Junkie Newsletter issue) above uses several of the images from the clear photopolymer stamps that are part of today's giveaway. To make this card, I started by coloring the dog with Copic Markers, then I created a mask for him. I followed the rest of the directions for the Masked Spellbinders Technique.To create the stamped background around the dog, I simply placed all of the words and small images on one acrylic block and stamped it repeatedly over the masked dog. That is one of the great advantages of clear stamps -- PERFECT placement! 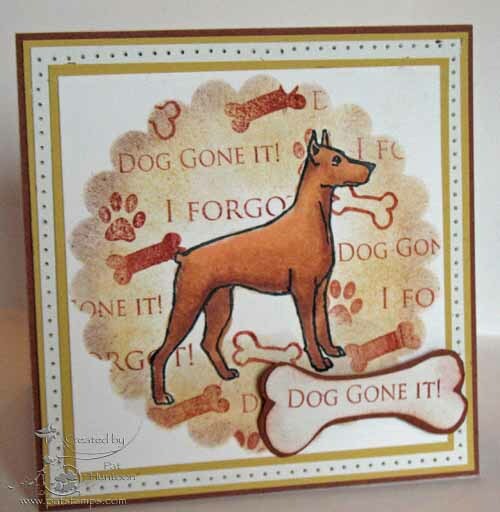 This 4" x 4" card uses the gorgeous golden paper from Mark's Finest as the base, too. 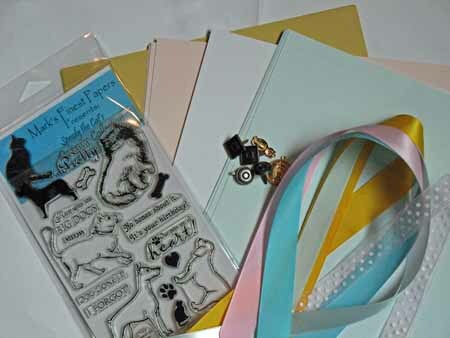 In addition to the stamps, the winner will receive 5 sheets of 4 different papers;several cat themed charms; the stamp set; and 4 different matching satin ribbons. Certainly enough to make some gorgeous creations! As an added bonus, Faith from Mark's Finest Papers is offering a generous 15% off between now and April 4th. Simply enter the code TJ415 at checkout. To enter this giveaway, simply leave a comment on this post below. Make sure to let me know which of the Mark's Finest Images are your favorite! Leave your name and email address (try this format p huntoon at optonline dot net for phuntoon@optonline.net -- it is a way to reduce spam!) in a comment on my blog by 9am EST Monday, April 5th. My random number generator will pick someone randomly. If you are the lucky winner, I will notify you Monday and send the loot right out to you! Make sure you leave your email address though -- if you not, I may have to pick a different name, and you will miss out! You do not need to be a Technique Junkie Member to enter the giveaway. Good Luck! Congratulations to Phyllis Freese, the winner of this giveaway! 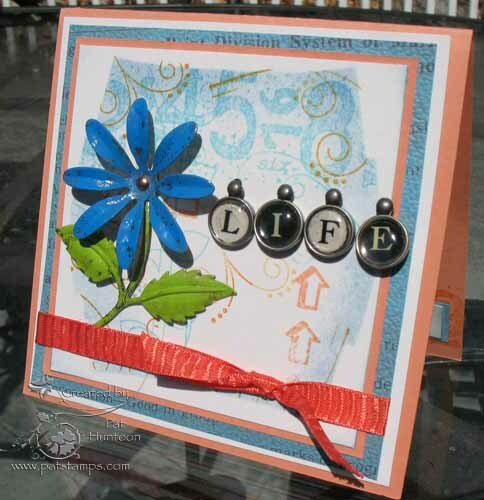 Today is the day for our Technique by Design Blog Hop featuring the sketch from the April 2010 issue of the Technique Junkie Newsletter. If this is your first stop, make sure that you start at the beginning at the Design Team Blog. The TJ designers have created artwork that is sure to inspire you! And, of course, there is a fun prize package for those of you who try the sketch, too! For this interpretation of the sketch, I used the Faux Velvet Technique from the current April 2010 issue for the large green part, Double Embossed Metal from the February 2010 issue for the panel on the left, and the Simple Whitewash Technique for the 2 thin green panels. On top of this is an image from Mark's Finest Papers -- our newest TJ advertiser. 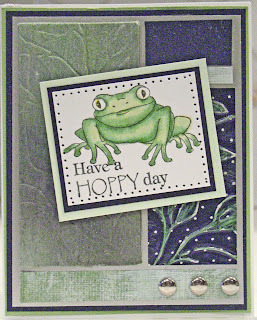 I love this frog, and I thought he was perfect for OUR HOP! It's your turn to try the sketch! A word of caution, though, use the dimensions online, on the subscriber-only pages -- the dimensions on two of the pieces are misprinted in the paper issue. You can get there from HERE. (make sure to have your password handy). I will also send you a .pdf of the sketch dimensions if you email me, too (TJ subscribers only, sorry!). That way you can keep it with your printed piece. A $25.00 gift certificate to ONE vendor of their choice from this issue's participating advertisers: I Brake for Stamps; Paper Temptress; Firecracker Designs by Pamela; Mark's Finest Papers; Croppinsville; OR Twisted Papers! YOU get to choose the place to spend your cash! You must be a Technique Junkie Member to enter a sketch card. Let's see what you can do...hop on over to your work area and get creatin'! Today's Blogger's Challenge was a sketch challenge. My card is loosely based on the sketch (on the right). 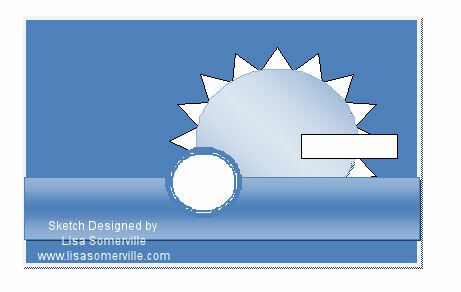 I needed to drop one of the elements in the sketch to create balance for my card elements. I am really happy with the way this turned out! I used the Scored Diamonds Technique from the April 2010 issue of the Technique Junkie Newsletter to create the green background. I layered an image from Twisted Papers over it, and added a ribbon, along with some piercing details. The "Happy Easter" saying is from Stampin' Up!. Take note: A new offer is posted from Twisted Papers, too -- a free CD with every $25.00 purchase! If you love the vintage images they carry, I suggest you go on over. (Details of the offer are on my site in their ad, or on my sidebar in the ad). If you are a Technique Junkie, you many want to know that the link to the April 2010 issue is LIVE -- you can access the 16 tutorials in the issue right now! If you are a junkie and you need a password, feel free to email me for it at phuntoon@optonline.net. I will get back to you ASAP with YOUR password. Make sure you visit the other BC players this week -- their work is wonderful! Just click on the Blogger's Challenge icon on my sidebar. Have a great weekend! Not only a Giveaway -- but a Sneak Peek at an April 2010 Technique Junkie Technique, too! I consider myself a pretty enthusiastic person. I get excited pretty easily, and I approach life with gusto. So when I am really excited -- I mean, like, over-the-moon excited, it is really something! Today's giveaway from Croppinsville makes me feel that over-the-moon excitement! First, I love the card I made. I used the Masked Spellbinder's Technique that will be coming out in a day or two in the April 2010 issue of the Technique Junkie Newsletter. 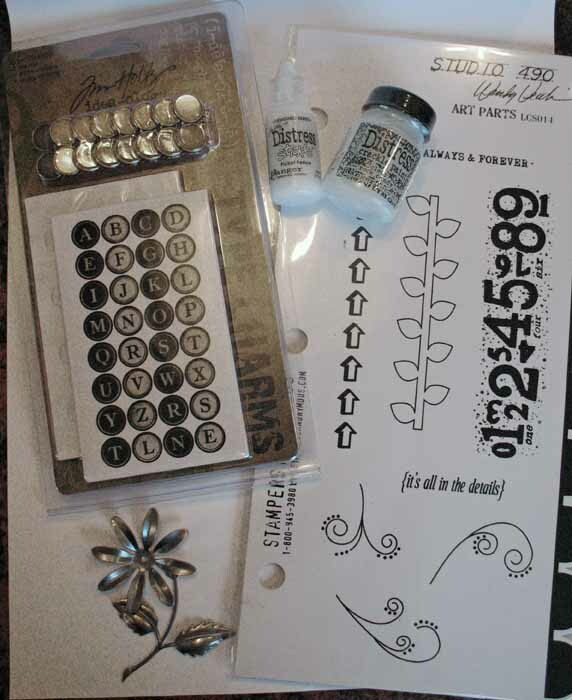 I used the Wendy Vecchi/Stampers Anonymous Art Parts Stamps -- the stamps part of the giveaway -- for my masked area. 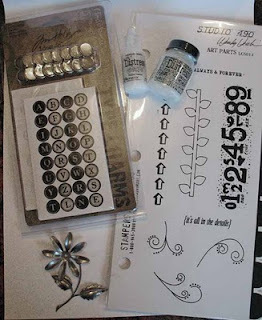 That is topped with Tim Holtz's Type Charms, and then these REALLY cool metal flowers that I painted with Adirondack Acrylic Paint Dabbers. I ADORE this card. That probably sounds a little less-than-humble, but I think it is good to really love what you do sometimes, don't you? In any case...back to the giveaway. All of the items in this giveaway are from Allie Gower and Croppinsville. There is so much in this giveaway that I couldn't even use it all on my card! Custom made Metal Flower and Stem parts from Croppinsville. You can find them HERE (they are listed under Allie Gower on the site's product listing) These are the coolest part of this whole giveaway! They are unique, dimensional, and to be honest with you, Allie is selling them on the Croppinsville site for a SONG. If you have not been there to see these, take my word for it, they are worth getting excited about!!!! Oh yeah -- you will get my card, too. See why i am excited? So here is what you need to do to enter for this giveaway. Leave your name and email address (try this format p huntoon at optonline dot net for phuntoon@optonline.net -- it is a way to reduce spam!) in a comment on my blog by Monday, March 29th. My random number generator will pick someone randomly. If you are the lucky winner, I will notify you Monday and send the loot right out to you! Make sure you leave your email address though -- if you not, I may have to pick a different name, and you will miss out! You do not need to be a Technique Junkie Member to enter the giveaway. Good Luck! Congratulations to Deborah David, the winner of this giveaway! We haven't had a giveaway in the last 10 days! Anyone going through withdrawal? I meant to post this earlier this week, but I had a lot going on...and it just slipped! Today's giveaway is sponsored by Club Scrap. 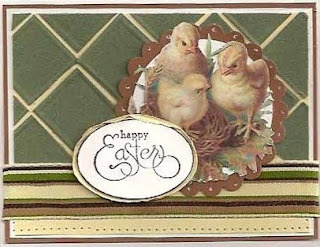 In addition to this card, the lucky winner will receive a huge package of 12"x12" paper AND an unmounted stamp set loaded with images from CS' March 2009 Kit called COMMON THREADS. First there is this huge 12x12 paper pack:. I have been a Club Scrap member for years (since 2002), and I am a huge fan. I always makes me happy to be able to "convert" non- CSers -- because once you start, you can't stop! You will be spoiled by the fabulous papers and Club Scrap's unique style. Not a scrapbooker? No Worries -- Club STAMP is for you,! Use the link HERE to enter their site and check it out for yourself. 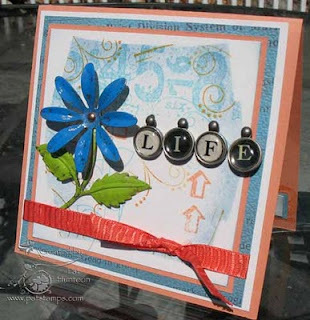 The card at the top of this page is a Triple Play card from the February 2009 issue of the Technique Junkie Newsletter. A simple card -- and sometimes, simple is best, no? To enter this giveaway, simply leave a comment on this post with your name and how to reach you; I will select a winner Monday morning. Good luck! The winner of this giveaway is Priscilla LaBranche. Congrats, Priscilla! The newest Technique Junkie for Life is....KATHY ROSSITER! Kathy Rossiter is the winner of the February 2010 sketch challenge as picked by my Random Number Generator from the submissions to the contest! Congratulations, Kathy! Kathy will automatically receive all future issues and CDs, plus any special publications, as long as I am publishing the Technique Junkie Newsletter! A slideshow of all of the sketches entered is below. Thanks for playing! So why am I posting this Christmas card in March? Well, did you ever make something that you loved and that inspired you, then you lose the item you made? Um, well, guess what this card is? It was the original inspiration card I made (over a year ago, mind you) for the Metallic Pop Technique (December 2010 Technique Junkie Newsletter). 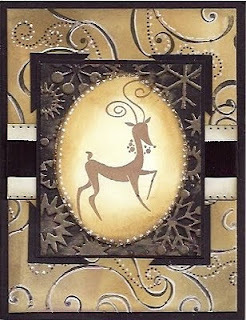 I made the card in the Fall of 2008, planned on doing the technique, set the card aside...then could not find it when I decided to use the technique in December. It drove me INSANE to have lost the card! So guess what I found this week? What kills me is that I found it in a VERY logical place, too. I figured I better scan it and save it before I lose it again...So Merrry Chrismarch! On Saturday I decided to clean my desk. among the many things I found was negative from a leaf punch I had, and I happened to be putting away a new stash of Paper Temptress paper (had to caress it first!). Somehow, somewhere, a few Copic markers forced themselves on me and I stopped cleaning and started creating! My Airbrushed Markers Card (Technique from the February/March issue of the Technique Junkie Newsletter) was made using the Paper Temptress Poison Ivy Iridescent paper. 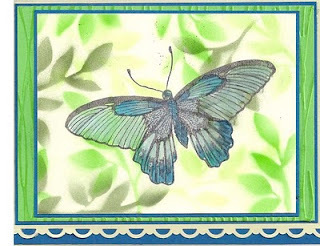 The butterfly is from Innovative Stamp Creations. I colored it very lightly -- I wanted it to have a translucent effect.I think I am a little stuck on greens and blues this month -- it is one of my favorite combinations. And yes, eventually I did clean my desk on Saturday -- but I messed it up on Sunday again! Ah, the creative process...sometimes it is NOT pretty. But I DID come up with a cool technique for June!